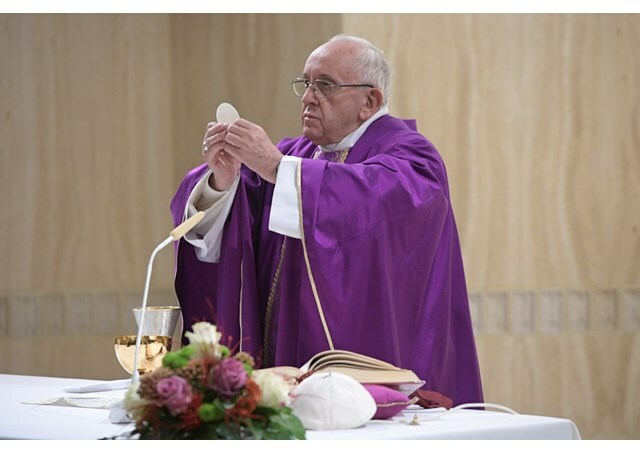 Catholic News World : Pope Francis in Homily - Prepare for Christmas by building peace in one's soul, in the family and in the world through humility. Pope Francis in Homily - Prepare for Christmas by building peace in one's soul, in the family and in the world through humility. At his morning Mass at the Casa Santa Marta on Tuesday, Pope Francis spoke about how Christians can prepare for Christmas by building peace in one's soul, in the family and in the world through humility. Pope Francis is urging Christians to prepare themselves for Christmas this Advent season by being humble and trying to build peace in their soul, in their family and in the world. Delivering a homily at Mass, Friday morning at the Casa Santa Marta in the Vatican, the Pope said that peacemaking consists in not talking evil of and harming others, a bit like imitating God, who humbled Himself. He urged Christians to examine themselves whether they are at peace or at war in their families or against others, whether there are bridges or walls that separate. The Pope then spoke about making peace in the world where there is much war, disunity, hatred and exploitation. Christians should ask themselves what they are doing about creating peace in the world by working for peace in the neighbourhood, in the school and in the workplace. The Pope urged Christians to ask themselves whether they find excuses to make war, to hate, to talk ill about others and condemn or are they meek and try to build bridges. Stop short of "small wars"